Charles Ramsey said he was eating a Big Mac just before rescuing three women and a child in Cleveland. A golden marketing and do-good opportunity for McDonald's may have lost its luster. The fast food giant found itself at the center of big news this week in Cleveland, when Charles Ramsey freed three women and a girl who police say were held hostage for years. Ramsey became a viral video star, and in interview after interview, he told TV anchors that he had gone to McDonald's before rescuing the women and rushed to their aid carrying a "half-eaten Big Mac." Ramsey was immediately lauded as a hero, and thousands of people took to Twitter to urge McDonald's (MCD) to take action. "Free burgers for life!" one man tweeted. "It was the best advert you could get -- Heroes eat Big Macs," another wrote." Other called for him to star in a commercial and become the next Ronald McDonald. The burger joint was so inundated with suggestions that the company felt compelled to respond, according to Danya Proud, a McDonald's spokeswoman. So, McDonald's Corp. tweeted: "We salute the courage of Ohio kidnap victims & respect their privacy. 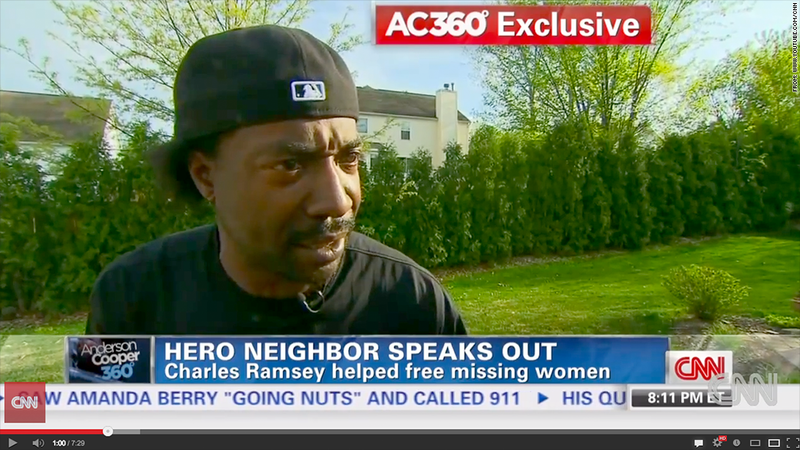 Way to go Charles Ramsey - we'll be in touch." Proud told CNNMoney that McDonald's would contact Ramsey, though it would wait out of respect for the victims and their families. But court documents detailing Ramsey's run-ins with the law surfaced after McDonald's sent its tweet on Tuesday. Ramsey has been convicted in the past on charges of domestic violence, burglary and drug abuse, and he served time in jail. His last run-in with the law was in 2003. Ramsey told CNN he didn't want to comment. When contacted on Thursday with the findings, Proud said that McDonald's had not changed its stance. The company and local franchisees will be reaching out to him directly as McDonald's said it would.